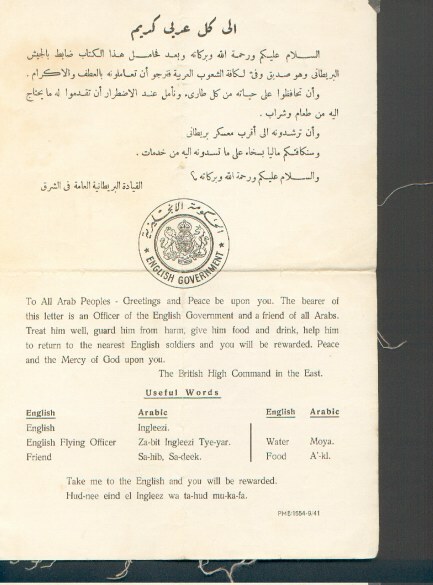 This reward notice was printed on a small card and provided to RAF aircrews in the Middle East in the event of a bale out or crash landing. The idea was that it could be used to buy your way out of a tight situation, I have never seen a documented incident where these were used successfully or how much the RAF may have paid out. This one is a little different than the one above it. Hilariously, it would appear the value of an RAF pilot was decreasing in value because the notation "much money" and "liberally" has not been included on this one. 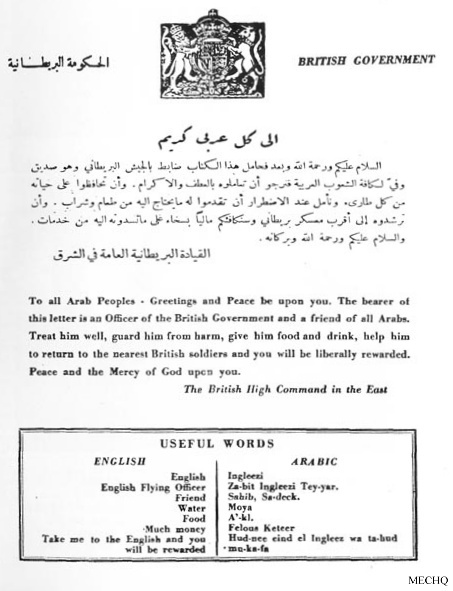 Sgt Brooking gave the following ghastly explanation: These were known as "Ghooley Chits", and printed in Arabic as well, for use in the African theatre. "Ghooley" was Arabic for balls. The story was that earlier in India, and later in the early stages of W.W.2., in Italian East Africa, Any prisoners taken were handed over to the women of the tribes. Their custom was to remove the male appendages, stuff them in the prisoners mouth, and sew them in. Not a pleasant way to go. Hence the name "Ghooley Chits" One wonders if they were exacting retribution on the prisoners, or was it meant for all men. 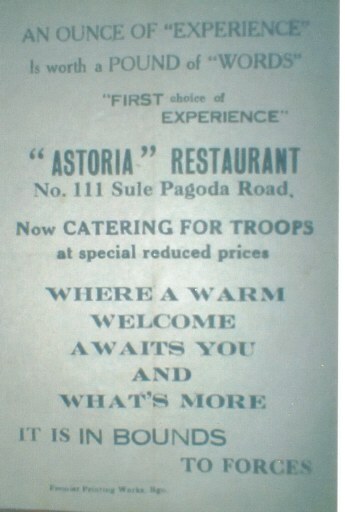 My guess is most airmen kept this notice in their pocket but note the airman on the right in the picture below. He wasn't taking any chances, he has his reward notice emblazoned on his back. 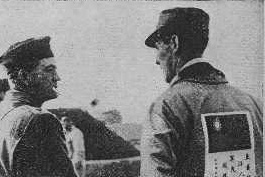 Actually, this is a picture of none other than the famous Clare Chenault, mastermind of the American AVG (American Voulunteer Group) in Burma talking to one of his pilots. 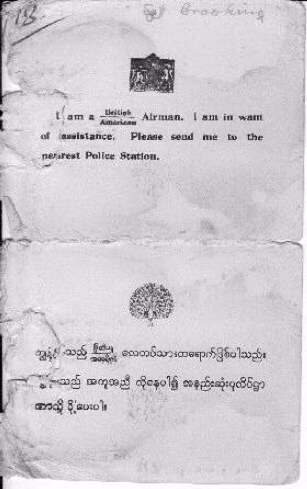 The large notice on the pilots back is the AVG personal flag, and the message underneath is a reward message similar to the above card that the RAF carried. A very silly looking but excellent idea, another brainchild of Chenault's I would imagine. 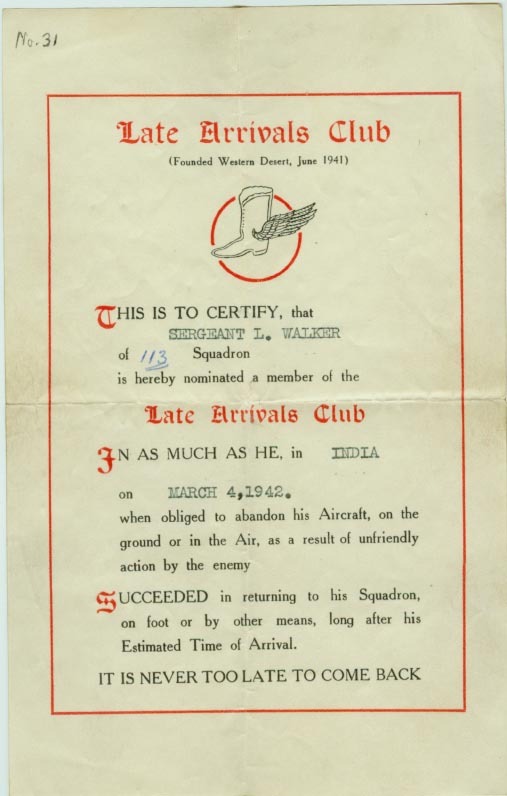 Awarded to Sgt Lister Walker after being shot down on 4/3/42. It was a miracle he survived the crash, the aircraft then being strafed again by the japs as it lay burning. The only survivor, it took him 2 days to walk out to the closest base at Thamatpin. Note top left that this particular one is the 31st issued. 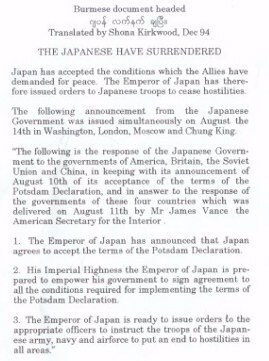 It would be interesting to know how many were issued and the stories behind all those who got them. The squadron converts from Blenheim bombers to single engine Hurricane fighters / hurribombers. 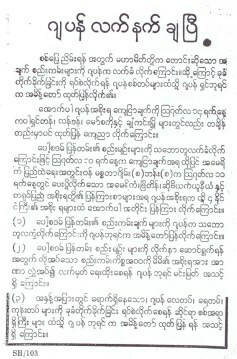 Contrary to popular belief, it seems there was no thought of disbanding the squadron at this time. 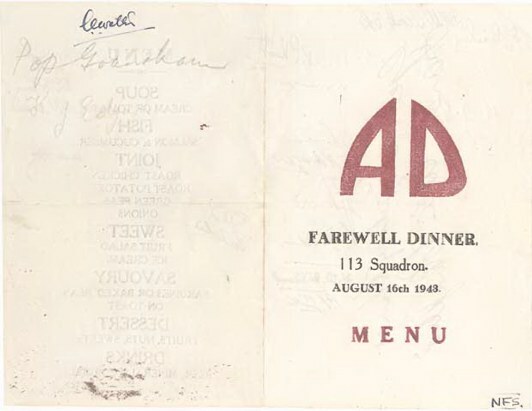 Rather, because so many were being posted out of the squadron during conversion it was decided to have a last dinner for them. 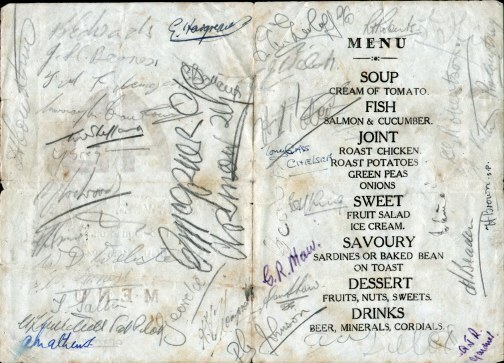 This is Corp Norman Say's personal menu copy, it is not known if there was a separate dinner for commissioned Officers, but it is quite likely, in which case these signatures will be all from Ground Crew. 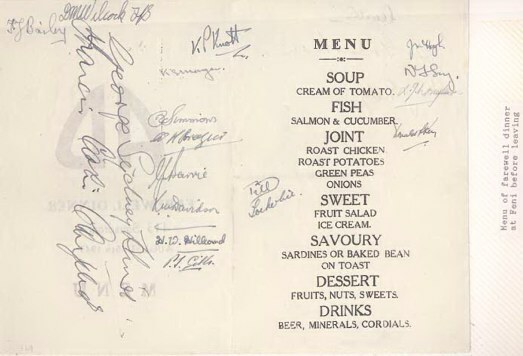 Click here to see the Second, "Last Supper of the 113"
Some of the names listed: H. Courtney, B. Edwards, E. Hargrave, R.H. Courtney, H. Brown, C. Robertson, C.A Gerloff, R. Roberts, Dan Shaw, K.V Thompson, R. Johnson, G. Mathews, T. Salter, W.D Webster, K. Smith.